The competition is subject to a non-refundable registration and administration fee of £50+VAT for professionals. Please use the register button below and follow the appropriate link to make an on-line payment. The Unique Registration Number (URN) to be used on each element of the submission to maintain anonymity. 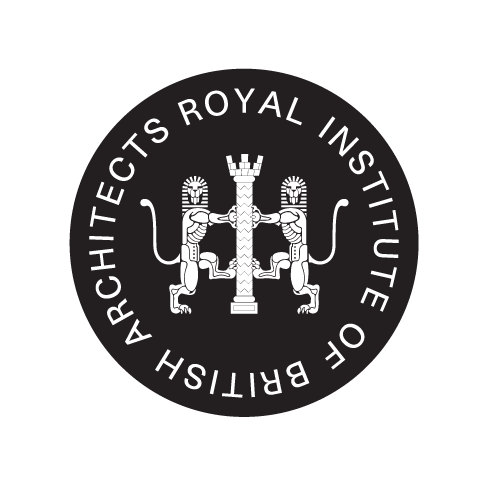 A unique link to RIBA Competitions' digital submission portal. Life on Tristan, as in any farming/fishing community, is ruled largely by the weather. Daily life involves tending to livestock and crops in a timeless routine, mixed with seasonal activities such as shearing, digging, planting and harvesting. The Islanders rely to a great extent for their food on their own stock, poultry and crops. Potatoes are the main crop, grown at the Patches about two miles from the settlement. Other vegetables are also grown privately. In many ways, the Government and community can be considered as being synonymous within the context of life on Tristan. The Government is the principal employer on Tristan, with a work force of approximately 140 spread across 11 departments which include Agriculture, Conservation, Education, Finance, Fishing, Medical, Post Office & Tourism, Public Works and Telecommunications. All services (fuel, car repairs, plumbing etc.) are provided by the appropriate government department that are open to the public during working hours Monday to Friday. 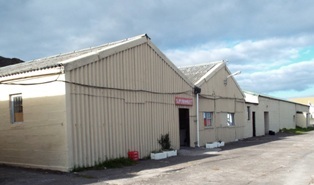 The Government-owned Island Store imports and sells a limited variety of foodstuffs, household equipment and clothing. There are no other shops or restaurants. 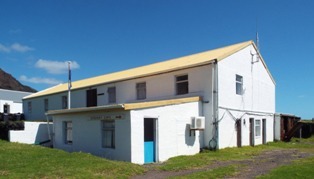 The only (again, Government run) pub is housed within The Prince Philip Hall, which is the social hub of the island and contains a hall that is used for occasional dances and indoor sport. There is an open-air swimming pool located nearby. Although rarely used, a 'golf course' that is shared with grazing cows, provides some relaxation. There is a small library with a limited range of books, an Internet Café, plus limited access to gym equipment. 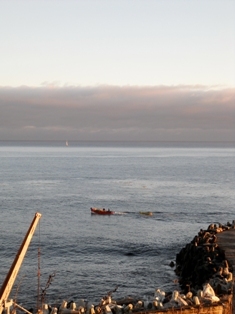 Fishing and related activities are the second major source of employment on the Island. During the fishing season the dawn ''dong'' is sounded to signal a fishing day, which involves the majority of the Island workforce (including pensioners), in landing and processing the catch. There are 12 small island fishing boats each with a two man crew, and if it is a fishing day the men will excuse themselves from the 'Government' work and go fishing. Losing 24 men from the Government each fishing day is a considerable drain on the limited resource base. 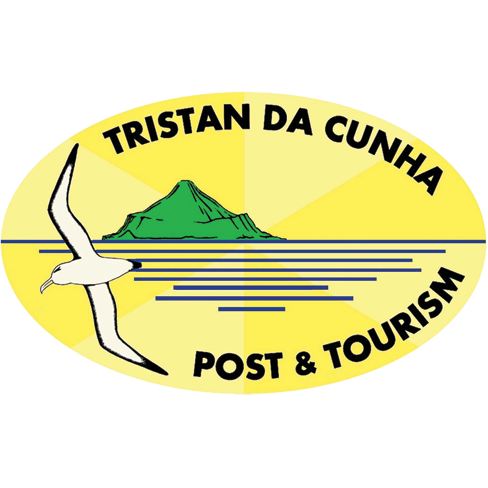 Tristan's primary source of income is generated via a royalty agreement with a South African-based company which operates the lobster fishery under the terms of an exclusive concession granted by the Island. Tristan da Cunha Rock Lobster has been certified as a sustainable seafood by the Marine Stewardship Council. The island now has a satellite tracking system to monitor vessels that enter the Island's Exclusive Economic Zone, with recourse to Royal Navy assets in the region to deter illegal fishing within its waters. Product is exported to the US, Australian, EU and Japanese markets. The company ship fishes around all the islands, whilst the fleet of small island boats also fish around Tristan and catch lobster for processing in the factory, which provides permanent employment for 9 Islanders. 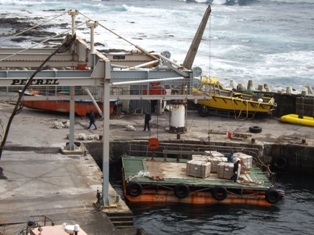 In addition to the royalty and employment, the fishing company also provides vital power generation for the Island and a limited passenger (just 12 berths, 8 times a year) and cargo service to Cape Town. Other small sources of revenue include interest from a reserve fund, the sale of stamps, coins and handicraft souvenirs, together with modest income from tourism and visitor accommodation. This helps finance government activities such as the provision of free healthcare and education, with additional financial support from the UK government. Tristan's economy is however shrinking and the cost of living continues to rise. Large capital projects require overseas funding - for example, the European Union recently funded new electrical and water reticulation systems for the Island. In order to avoid becoming reliant on budgetary aid from the UK, it is critical that cost-effective long-term solutions are found to improve the community, to make buildings energy efficient and reduce the living costs of the Island's population. It is also important that key structures such as Calshot Harbour (or its future replacement) and irrigation systems are able to deal with future demands on the society. The scope of this competition embraces a wide field of design expertise and entrants should assemble a team with appropriate skill sets to address the following opportunities in their proposed solutions. Government (community infrastructure) buildings on Tristan are all of basic construction and lean more towards agricultural sheds as opposed to the usual notion of a government edifice. This disparate set of buildings are spread across the Settlement and accommodate a range of uses - further details of which can be found under Additional Background Information. Many of the buildings are nearing the end of their useful life and need to be re-provided to meet the future needs of the community. Reduction of running costs via consolidation of the government footprint and improved performance of buildings will ensure the viability of the Settlement for future generations. Entrants are invited to propose their approach to replacing or refurbishing the Administration Office, Island Store, Agriculture, PWD, Telecommunications, Conservation, and Fisheries Departments. These should be kept within the footprint of the Settlement and bear in mind the constraints set out below. Replacement of the hospital accommodation is the subject of a separate current initiative and can be excluded at this stage. There are approximately 120 private homes on the Island - there is no 'property market' as such with individual properties tending to be passed within families. All properties are single-storey and range from croft-style dwellings to more modern bungalows - further details can be found under Additional Background Information. Construction of the houses is variable, but lack of insulation, lack of central heating, the maritime damp and mould are common complaints. Entrants are invited to make proposals that will address, if not eliminate these issues and fundamentally reduce energy consumption. Despite a high annual rainfall, the community suffers water shortages during the austral summer months which affect their living as well as their agricultural needs. Entrants are asked to submit proposals to overcome and fundamentally improve methods of water management including rainfall capture, retention, storage, recycling etc. The sole supply of electrical power to the Community is via the diesel-powered generators provided by the fishing company that operate the lobster processing plant. Bottled gas is also shipped in and used for cooking, space heating etc. The Island trialled a small wind turbine in the mid-1980's, but this was destroyed after a few days by the high winds, and since then, there has been a general reluctance to re-visit renewable energy technology. An EU-funded project to install three photovoltaic water heaters to residential properties and construct a small solar farm is due to be completed by mid-2015, whose effectiveness will then be monitored. It is understoodthat there has been no research undertaken on how the Island's natural resources, weather, or sea can be embraced to generate energy. Entrants are requested to advance proposals to achieve the Island's ambition that at least 30-40% of its energy needs are met by renewable means within the next 5 years. As part of the overall aim of this competition is to increase the self-sufficiency of the community, entrants are asked how they would address other issues, apart from the built environment, such as the paucity of soil quality, and new approaches to enhance the productivity of the limited land area dedicated to farming, and the year-round growth of alternative crops. The poor water retention and quality of the soil affects both the crop growing capability and quality of the pastureland on which the Island's beef and sheep herds graze. The Community are keen to take better advantage of the opportunities afforded by the Island's relatively benign (in terms of temperature) climate. As part of the drive to self-sufficiency, the Community is eager to learn new skills that will support their life. Owing to the limited berths on the ships, it makes it more practical to send trainers to the island to mentor and up-skill a cadre of Tristaninas in-situ. Skilled persons need to be brought in for limited periods, which in addition often entails the importing of specialist accommodation and/or workspace in the form of converted shipping containers etc. This can put a strain on the facilities and budgets. Entrants are therefore asked to consider the element of training the local population, in any areas of expertise required to deliver the design proposals (across all aspects of the competition) and which in turn could be used to justify the rationale behind the proposed solutions. Embrace and enhance the unique culture and heritage of the Island, by respecting the setting, materiality and spirit of the existing environment. Consider the logistical challenges in visiting and gaining access to the island in terms of provisions, materials and personnel. The fishing and cargo vessels (8 ships per year) bring cargo and mail to the Island as well as passengers (maximum 12 per ship). The South African Antarctic Survey ship - the ''Agulhas II'' - calls once a year. A few cruise ships also call, but due to the harbour and prevailing weather conditions, the passengers cannot always disembark.There are ad hoc (semi-annual) visits from Royal Navy warships, although likewise it is not always possible for all their crew to disembark depending on weather conditions. Recognise that Calshot Harbour can currently only accommodate small boats, RIBs and rafts/barges that are used (20 tonne limit), when conditions permit, to transfer all in-coming and out-going goods from the ocean going vessels that have to anchor out to sea. This may therefore restrict the proposed use of pre-fabricated components or modern methods of construction. Scenarios which would entail either a significant increase in breakwater defences or a new harbour are likely to cost tens of millions of pounds, which the Island is unable to fund through current UK or EU funding streams. Therefore low-cost initiatives need to be identified to sustain the current structure. Entrants should base proposals on the likelihood that the constraints on boat size will remain and the limitations on unloading any ship must be a consideration in any design or other solution proposed. Embrace sustainable design principles, which given that the Island economy is finite, will need to offer pragmatic approaches that will offer tangible savings in the short to medium term. New buildings should be constructed to comply with UK building codes where practical and appropriate to do so. It is envisaged that initiatives to improve the performance/energy efficiency of all residential properties will primarily be via refurbishment and renovation, and perhaps, limited new-build opportunities. Due consideration will need to be given to how a programme of work could be phased and rolled-out to renovate the existing housing stock whilst minimising disruption to occupants. The opportunities for existing Government buildings to be used for temporary decampment purposes during the refurbishment of residential properties may be limited, as these are essentially corrugated 'tin sheds' that would need significant improvement to make them habitable. Previous construction crews have shipped-in their own self-contained accommodation blocks (converted cargo containers etc). Give careful consideration to building forms and the selection of robust materials that can be readily-sourced, maintained and will be capable of withstanding the harsh maritime environment and high winds that buffet the island. The harshness of the environment should not be underestimated - newly purchased plant and machinery has often already started to corrode by the time it arrives on the Island. It would be advantageous to have building typologies than can be replicated or share a common kit of parts that can be easily constructed and repaired by the Island population. It should be assumed that all materials and specialist labour/trades will need to be imported. This could be a small external managing/guiding workforce as there is an ambition that the mentoring and up-skilling of Tristan workers will improve the Island's long-term self-sufficiency. Avoid un-tried and un-tested technologies unless a convincing case can be presented for their inclusion. The Island Community is small but vital. The financing of any capital construction or otherwise must usually be sought from outside funders, where the cost benefit per head of population is one consideration of the financial demand. Whilst cost will not form part of the assessment of the Phase 1 submissions, entrants should be aware of the likely window of cost of their proposals and can highlight any benefits they may wish to promote in this respect. Calshot Harbour is the life-line to the outside world, but can only be used infrequently due to the severity of the South Atlantic weather, and paucity in sea defences. The Islanders and the small expatriate community are entirely dependent upon the harbour - it provides the only means of access onto the island and without the structure the settlement would not be viable. The harbour was built from concrete dolosses when the Islanders returned from refuge in the UK after the 1961 volcanic eruption. The "landing beach" previously used and the fish processing factory were smothered by lava and the present harbour constructed to be close to the replacement factory. 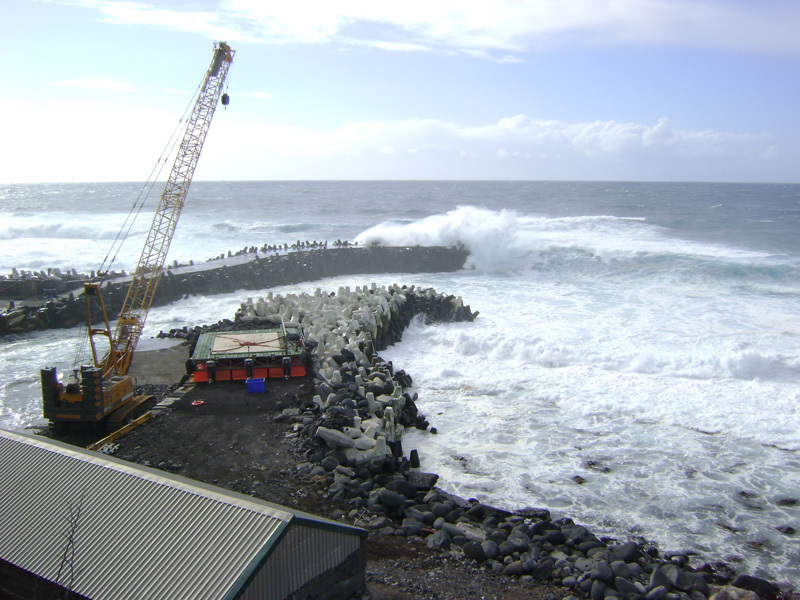 The harbour breakwaters are constantly battered by ferocious South Atlantic storms and sea swells; thus subsidence, holes, cracks and caves large enough for people to enter have been created. Emergency repairs are being funded by the European Union. Ocean going vessels cannot enter the harbour, as it is too shallow and a reef offshore constantly fills it with boulders: freight and passengers are transhipped at sea from vessels into small boats, RIBs and pontoons which can enter the harbour. The facility is available on about 60 days a year: otherwise sea swells and storms prevent its use. The proximity of the reef and adjacent shallow water cause waves to break into the harbour, undermining the walls and foundations and the cliffs above them. Given that it takes at least a week for a ship to reach Tristan from a South African port, the Islanders fear that should Calshot Harbour collapse, there would be insufficient time to organise a ''rescue ship'' with cranes, heavy-lift helicopter, building materials etc. to undertake emergency repairs before the Island runs out of fuel, medical supplies, imported goods etc. Relocate the harbour approximately 400 yards to the east of the current structure, next to the overflow from the 1961 volcano. However, it was concluded that due to the Island's prevailing weather conditions, the new harbour might still only be 'open' for the same 60 days per year. 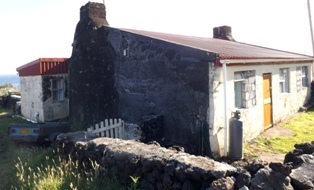 The Islanders have long been convinced that the only long-term solution which can guarantee them the ability to remain on their island home is a new harbour, located to the east of the Settlement close to where the 1961 lava flow entered the sea. However the 2013 WSP report concluded that although this would make the internal harbour basin safer, it probably wouldn't provide easier or more frequent access. The existing harbour requires constant maintenance - identifying new innovative but practical ways to improve access to the Island need to be identified. Tristan is comprised of a series of concentric topographic zones that reflect the conical shape of the active volcanic island. The island is 38 square miles in area and just over 25 nautical miles round. 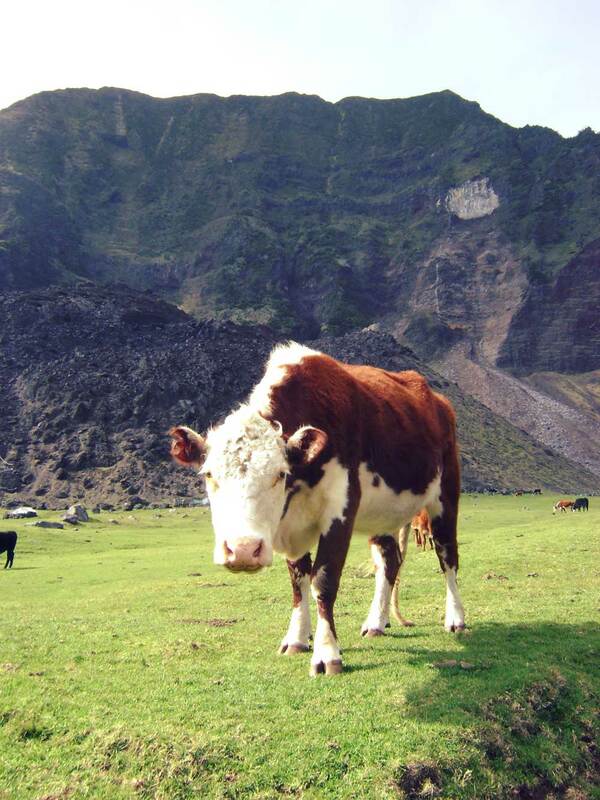 There are a series of pastures at the base of the fringing coastal cliffs with the latter rising steeply from the shoreline to a height of approximately 600m and penetrated by a number of gullies (known locally as ''gulches''). 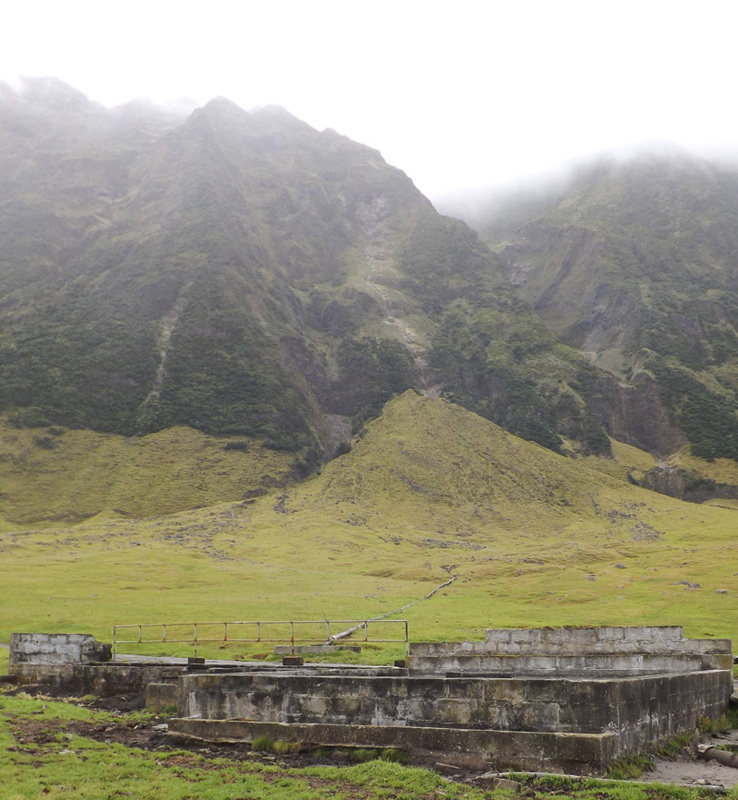 A plateau, known as the Base, lies above the coastal cliffs reaching a height of 2,060m in the island's central Peak. With the exception of the area around Edinburgh of the Seven Seas and the Patches grassland where animals graze further along the coast, most of the coastal pastures are only accessible by sea due to the fringing sea cliffs. Edinburgh of the Seven Seas is the only settlement on Tristan where all 268 inhabitants reside - there are no buildings above first storey height. Currently, only Tristanians can own property and cultivate a plot of land on Tristan. The seven family names of Glass, Green, Hagan, Laverello, Repetto, Rogers and Swain are the only surnames found on the Island, with individual properties tending to stay within the ownership of immediate families. The topography of the volcanic island limits access to and the amount of habitable and cultivatable land. The land mass is gradually diminishing due to effect of winter storms. There are 28 Government (community infrastructure) buildings on Tristan, which are all of basic, agricultural shed style construction. The buildings are either simple corrugated tin/zinc sheds or breezeblock construction with zinc/tin roofs. None of the buildings are insulated, properly ventilated or have damp-proofing. 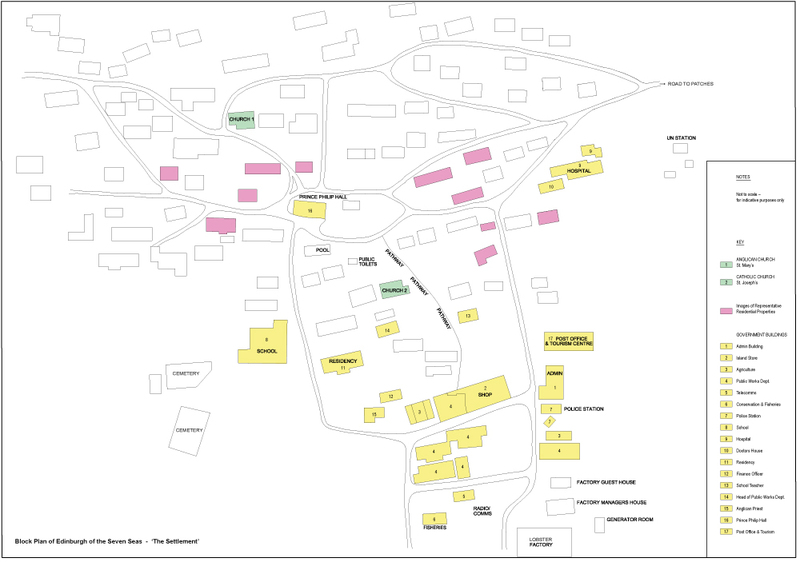 The approximate location of the various Government buildings within the Settlement is shown on the block plan and sketch map. Images of key buildings are shown in a series of accompanying sheets available under Supporting Information. The functions accommodated within each building are indicated in this accompanying Table. Housing 13 people. The building accommodates the Administrator (head of Government and two staff, Finance and Treasury (8 staff) commercials officer and finance officers. It also houses the Council Chamber, Internet Café and IT servers for the island. Constructed from breezeblocks and poured concrete with corrugated zinc roof. The one and only shop for the entire community - providing all foodstuffs as well as general DIY/home goods (approximately 9 staff). 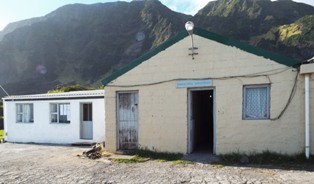 Constructed from a mixture of breeze blocks, corrugated tin siding, asbestos and tin roofing. Currently in a poor state of repair. Agriculture buildings are currently in three separate locations without storage for tractors and other equipment. The buildings are a combination of breeze block and tin construction. The largest department with approximately 60 staff spread across at least 5 main buildings as well as a number of smaller sheds for storage. PWD is split into General, Mechanical and Plumbing and Electrical Departments. 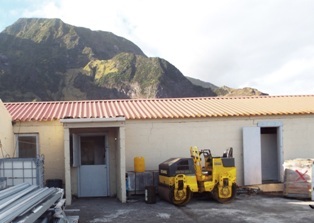 There is currently no structure to house all the machinery which is left out in all weathers leading to the rapid deterioration of all machinery on island. Once again simple breeze block construction. No temperature controlled environment for the servers, radio, and TV equipment leading to constant issues with IT services (5 staff). Both Departments share one building similar in construction to Telecommunications but partially recessed into the ground providing added protection from the weather (approximately 9 staff in total). There are approximately 120 private homes on the Island - all are single storey buildings. The oldest properties resemble Scottish crofters' dwellings and date back from the mid-1800s when the Island was first being settled. 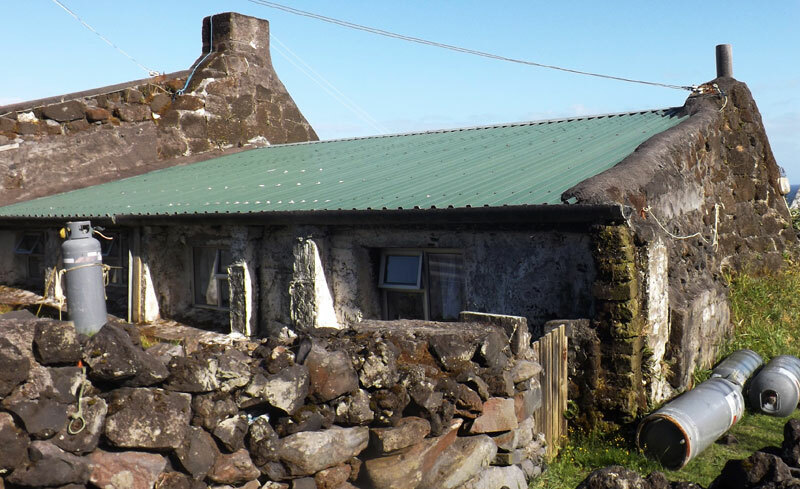 The properties were built from volcanic rock, and originally had thatched roofs made from tussock or New Zealand flax, although these have now been replaced with corrugated tin/zinc. Internally the properties use simple plywood walls to separate rooms. The more modern bungalow-style properties are built from solid concrete poured into shuttering or concrete breezeblock construction. There is no insulation or damp-proofing in any of the homes, and only one property has cavity walls. Some of the properties have also undergone previous renovation. Images of representative properties are shown in a series of accompanying sheets available under Supporting Information. Typical property sizes and electricity consumption are indicated in the accompanying Table. None of the properties have double glazing or central heating - some have limited space heating in the form of electric oil-filled radiators and/or free-standing gas heaters, but some have no heating whatsoever. Bottled gas is also used to heat water and/or for cooking. Owing to the high humidity and temperate climate - damp and mould are constant problems in all the homes. In the winter, lack of heating and the damp problems lead to respiratory issues for many families. The Island has experienced changes in climate over the past few years with colder winters. As noted previously, the fishing company vessels and Calshot Harbour are Tristan's physical life-line to the outside world. There are good telephone connections routed through a British government provided service that links to the UK and to which all houses are connected. Internet connectivity is poor with only 1Mb for the entire island and many web sites cannot be opened due to the paucity in bandwidth. Islanders do not have the capability to Skype, Tweet, blog etc. This has a significant impact on long-term development, as well as medical and educational development. The Island's electricity is provided 24 hours a day via four diesel-powered generators supplied by the fishing company who operate the lobster processing plant. The cost of electricity is currently 24p per unit although this fluctuates each year due to the cost of fuel, shipping etc. A new renewable energy pilot is now being trialled consisting of a small solar farm and three solar water heaters. To ensure the island is self-sustainable in the future it is imperative that energy costs are reduced and new sources of power identified. Pasture land is poor and the rainfall (although high) quickly soaks through the porous volcanic rock. While there are several small troughs and reservoirs, they can quickly empty. To ensure constant water supply for the livestock and pasture throughout the year, new irrigation systems need to be designed to retain the water and irrigate areas of poor grassland. There are two constant water sources on the Island. One is situated behind the 1961 Volcano and is only used by cattle, with the majority of the water seeping away into the volcanic rubble. The second water source is situated behind the settlement, with a small reservoir and water tank retaining water for the community's need. There are other streams, but they run dry during the summer months. As part of the proposals, it would be useful to identify new ways to retain and easily distribute water across the pasture land throughout the year. 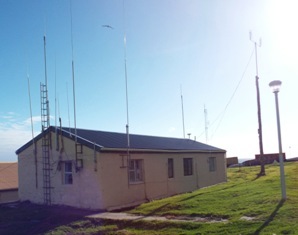 New electrical and water reticulation systems have recently been installed on the Island, which were funded by the EU. A new waste water system consisting of two septic tanks is being implemented in 2015. 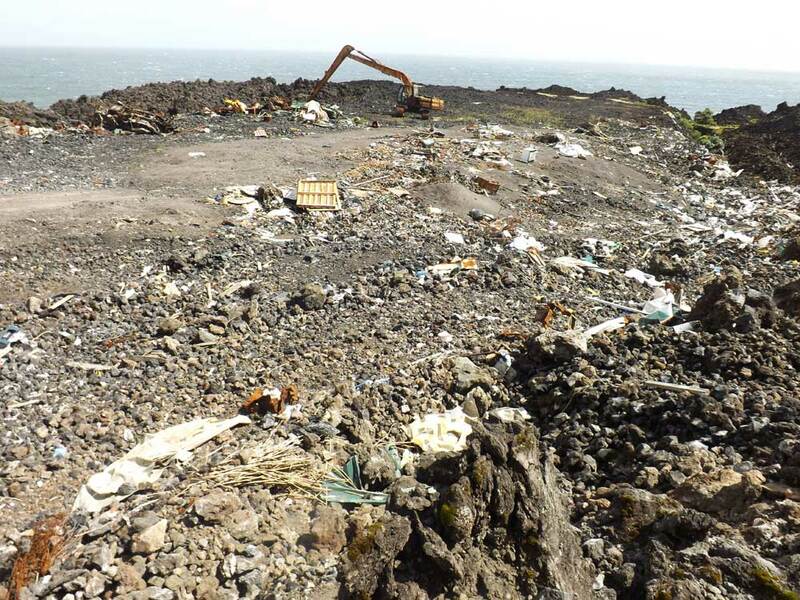 All other waste is sent to the Island landfill dump which sits on the 1961 lava over-flow. This is unsightly and could be environmentally hazardous in the future. Cost-effective waste management solutions will need to be identified to handle all waste on the Island. The Administrator (Currently HH Alex Mitham), appointed by the Governor of St. Helena, is the head of Government, which comprises 11 separate Departments. The Administrator takes advice from the Island Council, which is composed of 8 elected members and three appointed members. A general election is held every three years. At least one member of the Council must be a woman. The Councillor who receives the most votes in the election is appointed Chief Islander. The seas around the islands of Tristan are rich in finfish as well as lobster and octopus. Fivefinger, snoek, bluefish, stumpnose, steambras, soldier and mackerel can be found. The Yellow-nosed and Sooty Albatross nest on the Base at Tristan and on the other islands. Rockhopper penguins have established rookeries in various parts of the islands. Fur seals, elephant seals, the rare Shepherd's Beaked whale and the Southern Right whale all visit the Island. There is a rich and varied birdlife, including the Wandering Albatross, Petrels, Buntings and on Inaccessiblethe unique Flightless Rail. The people of Tristan are keenly aware of the need to live in harmony with their environment. 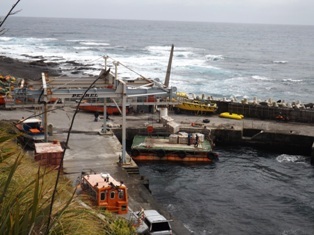 The declaration of Gough Island as a World Heritage site and of Inaccessible as a nature reserve means that 40% of Tristan da Cunha's land is under protection. 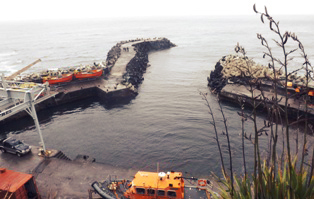 Gough Island has a Wildlife Management Plan to protect its unique environmental status.